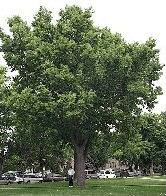 This tree in Colorado Common hackberry is large shade tree commonly planted in urban and community landscapes. It is popular because of its vase-shaped crown structure when mature. The shape is very similar to American elm but not as aesthetic. Because of its shape, it is recommended as a replacement for the American elm. This tree is considered a Colorado native and ranges in elevations from 4000 to 7200 feet, growing in wooded draws and valleys. In developed areas, the seeds easily germinate often becoming a nuisance in flower and shrub beds. Growth rate Medium to fast growth rate. Can reach 30 feet in 20 year period. Growth is not very uniform in early years. Branching habit looks very scattered and in need of pruning during the first 10 years. It needs pruning to make it look decent and to select a main trunk in these years. Soon afterwards, it begins to develop the graceful arching structure which makes it popular as a shade tree. Hardiness Zones 2 to 9. A very hardy plant for Colorado and it is also tolerates draughty conditions and some shade. Foliage Leaves are alternate; simple; ovate to oblong-ovate; 4″ long and 2″ wide with an acuminate apex; deciduous; serrate margins; rough to touch; born on zig-zag brown twigs. Leaves nearly always develop a small round gall on the underside. Flowers Not showy. The fruit is a small drupe about 1/4″ in diameter that ripens in September or October. Edible by birds. 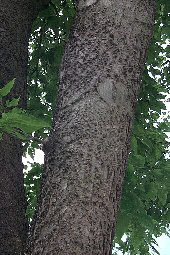 Bark Develops a characteristic warty look when older; grey; smooth when young. Hackberry is easily identified by its bark characteristic. Insects and diseases The most common appearance problem is the hackberry nibble-gall which forms on the underside of the leaves. If severe, the leaves do get disfigured. In most cases, no treatment is considered necessary. Witches broom is also a problem in some areas. This characteristic is caused by the abundance of twig and leaf growth in one area of the branch. It is often caused by Eriophytes mite. From a distance, the trees look like they have clusters of growth on the outer portions of the crowns. Landscape value Best suited for open areas and along streets. It would fit well into the home landscape if there is a need for a large tree and lots of shade. Planting close to the west side of the house (no closer than 12 feet) will provide comforting afternoon shade. The arching branches will shade the walls and roof. Planted as street trees, hackberries provides an interesting cathedral look similar to the popular American elm. Best advice Grow in areas where the crown will have adequate space. Mature crown diameter can reach 30-50 feet. Remember that it will look a bit ugly in its early years and may need regular pruning to gain a strong main-stem or leader.